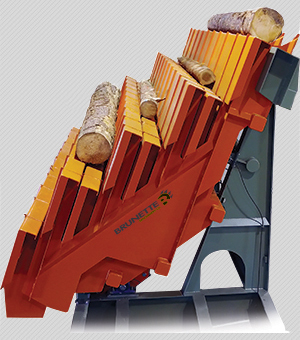 Our new generation Brunette Retract-to-Load™ (RTL) Log Singulator® is built to increase volume and add profits. The patented design’s expanding and contracting steps assist in log separation and rotation. In addition, improved efficiency and throughput is provided by secondary singulation at the nose — reducing log gap and improving piece count. The unit is balanced over center at the park or “pre-load” position. At this point all torque is negative creating negative inertia which increases acceleration and significantly reduces energy consumption. The RTL is in motion from the point where inertia is neutral (loading position) to the point where inertia is negative (park position), there is virtually no start and stop impact force on the drive components. Watch the video below to see the RTL in action.